Reprinted from Clay County Ancestral News 32, no. 1 (2016). Like most veterans of WWII, my father, Ambrose Burns, created a scrapbook of important events which occurred around him during his wartime service. Most veterans ranked their future contact with buddies as the most important aspect of their scrapbooks. Ambrose only took time to include six names and addresses on his list. The last entry was very special to him, though the soldier was in another unit, “Walter E. Woods [Serial Number] 35088189 Co. E. 169 Inf.” Walter was always close to my father, since the day they had met on a Manchester street during the yet unknown to them, waning years of the Great Depression. At the time, Walter was a detective with the Kentucky Highway Patrol (forerunner to the State Police). Walter offered my father a job with the Highway Patrol and the two worked side-by-side until their departure for military duty. They were working out of the London, Kentucky office, Post 11 at the time they submitted their resignation letters. Their time in the State Patrol prepared them in many ways for the carnage, fear and death they could expect would surround them in the Pacific Theater. It also provided them with a predisposed survival mindset – they understood that a man never quit in a fight if he wanted to go home. Both men resigned from their law enforcement jobs and enlisted in the U.S. Army at Fort Thomas, Kentucky, 29 May 1944. Their issued service numbers, only ten digits apart, reflect how near they were in line at their induction as soldiers. That was where their close partnership drew to an end for “the duration of the war.” To my knowledge, neither saw each other again until reconnecting after the war. Walter and Ambrose were both married when they enlisted. Walter married Ethel Smith on 1 October 1933 in front of Reverend Layd W. Smith at Bright Shade, Kentucky. By the time of his enlistment, Walter was the father of two children, a daughter, Jewell and a son, Jack. The Walter Woods family lived on Goose Rock, close to their relatives and their longtime family homesteads. Walter was the seventh of ten children born to James and Nannie, nee Spurlock, Woods. He was born at Goose Rock, Kentucky on 15 May 1910. Though his father was unfit for service during WWI, missing a finger on his left hand, Walter was surrounded by patriots. His older brother, Chester A, was a career soldier who served through WWI, WWII and Korea, before his death in 1991. His younger brothers, James, Warren G, and Woodrow W. all served in the Army, and Ted Reuben served in the Navy. 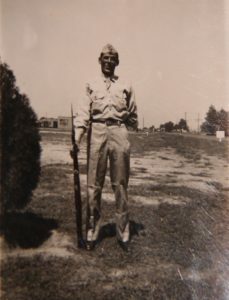 After basic and MOS (Military Occupational Specialty) training, Walter was assigned as an infantry rifleman to the 169th Regiment of the 43rd Infantry Division “Winged Victory.” The men of the 43rd Division were already seasoned veterans of combat operations on Guadalcanal-Russell Islands, New Georgia, and New Guinea, when Walter joined as a replacement. It was there on New Guinea that Walter caught-up with his permanent unit and was assigned to E (Easy) Company. He departed the western cost of America by ship on 2 December 1944. After zigzagging across the Pacific Ocean he arrived at Aitape, New Guinea on 23 December 1944. The division was already packing up and getting ready to ship-out to their next amphibious landing –Luzon, Philippine Islands. The 169th Infantry claimed its origin as the first Connecticut militia of 1672. The unit, in one form or another, had fought in every war its country had been involved in since that beginning. As the nation had done during the Great War, the unit was mobilized for federal duty on 1 February 1941, in preparation for another war that seemed inevitable. In March of that year the 169th moved by rail to Camp Blanding, Florida. The 169th, along with 103rd and 172nd Infantry Regiments, made up the fighting arm of the 43rd Infantry Division. After extensive training maneuvers the 169th was briefly stationed at Fort Ord, California, where it was refitted for overseas duty. On 1 October 1942, the regiment departed for overseas and combat. The 169th fought on Guadalcanal and in the New Guinea campaign. Operations in New Guinea greatly reduced the 169th’s numbers. With replacements pouring in from across the fifty states, the unit no longer resembled an exclusively New Englander entity. Even with those replacements, the 169th remained understrength by hundreds of men. Nevertheless, the 43rd Division began loading its equipment and supplies aboard ships in preparation for the assault on Luzon on 10 December 1944. While most of the regiment had a “traditional Christmas dinner” in camp, 197 men of the advanced party of the 169th RCT (Regimental Combat Team) loaded aboard the USS Golden City. She would be their taxi to the landing beaches on Luzon. 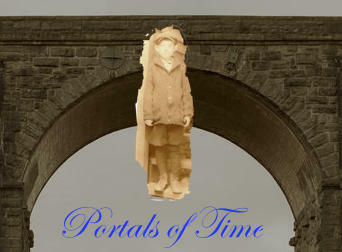 The following day, 26 December, the remainder of the Golden City’s passengers arrived aboard. The 2nd Battalion (Walter’s battalion) was designated to hit the beach in the sixth wave. However, just getting to their respective transports was a small fight. They stood in line on the docks until a landing craft loaded them aboard and ferried them out to the ship. They then crawled up cargo nets and located their bunks below deck. Golden City sailed out of New Guinea with 939 enlisted and seventy-three officers of the regiment. The 1st Battalion, 169th Infantry, along with the 1st Battalion, 169th Field Artillery and the 169th Anti-Tank Company were filed onto the USS Feland. As the flagship for “White Beach Attack Group,” the USS Cavalier also carried men and equipment of the 169th Infantry and attached elements from other 43rd Division units. The convoy departed New Guinea on 28 December. The first evening aboard the men of the 43rd where treated to a Christmas dinner; no one complained to the Navy that they had already had one Christmas feast. From there on, the ships’ crews earned their pay. Throughout the journey, the ships were harassed and attacked by suicide boats (known as skunks), and more frequently by Japanese kamikaze planes. Early morning, the armada arrived off the beaches of Lingayen Gulf. Each vessel took its assigned position and dropped anchor. From the deck of their transports, the men of the 169th leaned against the rails and watched the stages of preparatory bombardment of the beach and coastal inlands. The Japanese artillery was lobbing shells into the water in retaliation, just short of the ships. Their fire was sporadic, though, and it gave some of the infantrymen a bit of false confidence. The landing craft circled around the ships until the orders to load came across the radio. 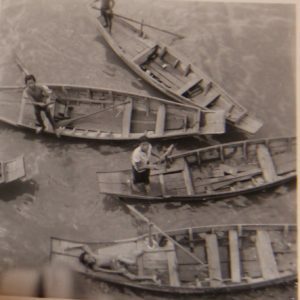 One by one, they pulled up next to the transport and waited while infantrymen gingerly crawled down the cargo nets and dropped into the boat. Once loaded, they pulled way so another landing craft could load, and took up a wide circling about 4500 yards from the landing beaches. Vice Admiral Daniel E. Barbey, from his flagship USS Blue Ridge, issued the command “deploy” [the landing craft] at 0645 on 9 January 1945. At that point, Commodore C. G. Richardson, aboard Cavalier, took tactical command of the landing operations. Artillery shells fell all around the landing craft as they made their way to the beach. The big shells caused great eruptions of water and it rained down into the open landing boats. As the 169th made its way in, one landing craft took a direct hit. Some men dove over the side to escape and others, not so lucky, floated lifeless on the surface. There was nothing their fellow soldiers could do, but pull their own helmets down low and pray they would not be the next unfortunate boat hit. The mission of the 43rd was to secure the left flank of the 6th Army. Their area of responsibility would encompass everything between San Fabian-Damortis, on the left, to the Agno River on the right. The landing craft of the 169th RCT landed on beaches codenamed White Two. They were the center of the division with the 172nd on their left (north) and the 103rd on their right. It was assumed by the planners that the 43rd would face the hardest Japanese opposition in the immediate days following S-Day (more commonly known as D-Day). At 0700 hours on S-Day naval bombardment commenced, dropping tons of ordnance on the beaches. The smoke hung heavy over the white-sand beaches, where in less than two hours the soldiers of the 6th Army would disembark and bring MacArthur’s promise to return to the Philippines to fruition. In the faint distance, those “dog faces” could catch a smoke obscured view of the heavy vegetation laden hills rising behind the northern landing beaches where the 43rd would come ashore. Just beyond the beach, three tiers of hills, increasing in height as they grew in distance from the beach, formed escarpments generally north and south. Each one of the dominant hills in those chains would have to be taken by soldiers attacking the Japanese defenders occupying them. Just after 0900 landing craft carrying the first waves churned toward White One and Two. When the ramps dropped, the soldiers were met by happy Filipino civilians and hands held high in the “V” for victory sign. The troops were informed by some of those civilians that the Japanese had pulled their men out of the beach defenses and sent them into the mountains to take up positions in fortified caves and bunkers. Soldiers quickly ran into abandoned pillboxes and other defensive positions; indicating that the Filipinos did, in fact, know what they were talking about. The 169th formed in a column of twos and marched toward their first objective, Hill 470, approximately three-miles inland and the highest point among its adjoining series of hills. By nightfall, the regiment had advanced to the Bued River and halted with the three battalions forming a bow-shaped perimeter. The 1st Battalion halted at the base of Hill 470; Walter’s 2nd, was in the center of the bow and the 3rd was on the right flank. From their fortified positions in the hills, the Japanese had thrown sporadic and mostly harassing artillery fire at the 169th all day. Except for small units of Japanese defending against their march, the Americans had not yet met determined opposition to their first-day drive. On day two, 10 January, the regiment advanced against Hill 470. For those replacements who had not fought the earlier island campaigns, it was their first encounter with the cleverly fashioned cave, tunnel and bunker systems of the tenacious Japanese. Each individual emplacement had common principles of construction: mutually supporting fire, ingeniously camouflaged and concealed to blend-in perfectly with natural terrain, and capable of withstanding prolonged impact by large shells and bombs. They typically were built with connecting tunnels which allowed the soldiers to retire to the back side of the hill and thus avoid the blasts of arching-trajectory weapons such as naval guns. Once the bombardment ceased, the gun position on the front of the hill could be reoccupied quickly. Hill 470 was taken but the 169th’s move toward their next objectives, Hills 318 (Mount Morling) and 355, were met with such concentrated mortar and artillery fire that they were forced to halt their attack. Hill 355 would go down in their unit history as one of the bloodiest undertakings during their advance across Luzon. The Chicago Tribune described for the American civilian what the men of the 169th were up against on their first heavy encounter with Japanese defenses on Morling Hill. The hill was 318 feet high with occasional vertical rock faces. The article stated “forced Filipino labor had built machine gun dugouts 75 feet apart, with snipers positions in trees and behind bushes.” Along with other casualities, 3rd Battalion’s Commanding Officer (CO), Lieutenant Colonel Arthur W. Bollard was killed in action on Morling. On 12 January, Staff Sergeant Robert E. Laws earned the nation’s highest award, the Medal of Honor for his actions above and beyond the call of duty. He was a member of 2nd Battalion’s G Company. Even with the unrelenting bloody actions and the advances, the 43rd Division, on the 6th Army’s left, was falling behind their objectives. Finally, on 14 January the 169th succeeded in clearing and holding Morling. The victory resulted in 70 causalities from a frontal assault on the hill. They regrouped and almost immediately initiated a two-pronged attack on Hill 355. Pressured from his commanders, to pick up the pace, Leonard F. “Red” Wing, 43rd’s commanding officer threw his men against the hill in costly frontal assaults. The first day’s efforts miserably resulted in fifteen killed in action (KIA), another fifteen wounded, and no closer to taking the objective. Wing was being directed to simultaneously take Hill 355 and cut a critical supply route for the Japanese by taking the intersection at Route 3 at barrio Palacpalac. The 169th, supported by tanks of the 716th Tank Battalion struck again and again at Hill 355. The entrenched enemy occupying the hill were hit with everything the Americans could throw at them: navy off-shore guns, air attacks and artillery, pummeled the hill. The risky decision was made to bypass Hill 355 and move on toward Route 3, until the hill could later be assaulted from the east (rear). The 3rd Battalion was left at Hill 355 to contain the enemy there and prevent them from attacking the rear of the two battalions moving at a forced march toward the two-lane hardtop highway. By the evening of the 16th, the 1st Battalion of the 169th was occupying positions across Route 3 at Palacpalac. Walter Woods’ 2nd Battalion was digging in near the barrio of Natanggalan. Because of their pace, it was deemed necessary to discontinue resupply until the 169th could make their new objectives. Throughout the 17th the 169th repeatedly fought off fierce counterattacks. On the following day, the advanced companies of the 169th took the crossroads at Bobonan. In actually, their objective, the “Y” intersection was north of Bobonan at Route 3, East of the barrios of Sison and South of Cauringan. It was a task that one 169th man called in a years-later interview, “a suicide mission…picked to be the sacrificial goats.” During the march of the main body, the 169th was beaten-up badly by Japanese artillery barrages. The Americans had now outpaced their own supporting artillery, and therefore, had no counter-battery assets. In command of the 2nd Battalion, and leading from the front, was Indianapolis native and West Point graduate, Lieutenant Colonel Harry F. Sellers. That day, in spite of the heavy enemy artillery falling on their heads, Sellers led his battalion in the destruction of five enemy roadblocks, arrived in time to prevent the destruction of a key bridge and captured uncounted caches of weapons and supplies. The march was so successful, and so rapid, that the battalion reached its objective by late afternoon. They had also driven a wedge deep into the enemy’s front line, creating a salient in the lines reminiscent of ones frequently formed during the trench warfare of the Great War. The downside of the bulge in the enemy’s lines was that 2nd Battalion’s perimeter was facing the enemy on three sides: from the east, west and north. The Japanese zeroed their artillery fire onto the Americans intruding into their lines until dark. Sellers had received tank support during his march along the road from the 716th Tank, but, believing the tanks were only drawing more accurate artillery fire, he ordered their commander to take them back to Pozorrubio. Not discounting the previous day’s good work, Sellers requested the assistance of the tanks at first light. About 2000 hours the moon appeared from behind Hill 355 and cast a light over the entire area so bright that it was almost like day time. Throughout the night, the battalion endured sporadic artillery bombardment and one banzai charge. With approximately an hour of darkness left, around 0430 on the morning of the 19th, forward observation posts reported what they believed to be foot traffic on the road south of the battalion. As it would too soon be determined, a unit of tracked Japanese vehicles ran into the southern perimeter of the 2nd Battalion. Behind the column of Japanese infantry was also a couple of horse drawn artillery pieces. Someone managed to get a call for fire back to the coastal area. The guns were soon abandoned after they were run off the road. Fearing that the guns might be reoccupied and limbered for firing, the call was made for the 37mm anti-tank guns to target the artillery pieces. The gunners made short work of the enemy artillery, thus preventing a disaster. Having soon after the first encounter lost communication with his outposts and company commanders, Sellers moved toward the fight on the southern line. Sellers had barely shored-up the southern perimeter when all hell broke loose on the western perimeter. He rushed toward that side to coordinate the repulsion of armored vehicles, trucks and tracked vehicles supporting Japanese infantry. It was around 0600, and daylight, when Sellers was struck and killed by machinegun fire while he was enroute to the fight on the west. In a fortunate bit of luck, the 716th’s tanks arrived on scene from the south. They helped to crush the attack on that side and open an escape route for the besieged 2nd. The Americans were then forced to withdraw to the Bobonan. On the south alone, the Japanese force that attacked the 2nd was estimated to be two battalions strong. Most were caught in the crosshairs and crossfire between the tanks and the 2nd. The bodies were stacked in piles in some places, where they had fallen in such great numbers. The Americans were not untouched by any means. The battalion lost thirty-six officers including Sellers. Of the more than 1000 men the battalion had landed with just ten days prior, they were now leaving the road junction with 650 men capable of fighting. Because Walter Woods’ military service record was among the hundreds of thousands of veteran’s records destroyed in a 1973 fire in the depository at Saint Louis, it is virtually impossible to know exactly what actions he participated in on Luzon. His daughter conveys a story told frequently throughout his life of one of the most harrowing experiences of his time on Luzon. He and about thirty men [a platoon size element] were pinned down by heavy enemy fire. Around fifteen of those men became so afraid that they attempted to withdraw from their position by dashing to the rear. With no cover, the men were cut down by Japanese fire. Walter took responsibility to save the lives of the remaining men. He informed them to the affect, if they would listen and remain with him, he would get them out alive. They did listen and followed Walter’s example. Walter awaited darkness and then low-crawled his men out of their untenable position. Again, there is no way of knowing for certain, but considering the high number of casualties to 2nd Battalion on 19 January, it is possible that this was a related incident. The men were far from relieved from combat, in spite of the heavy losses to the battalion. On the 21st they assaulted Mount Alava, considered to be a strategic key to further cutting off and taking the bypassed Hill 355. Once again, casualties were heavy. At 0645 the 4.2 mortars of 3rd platoon, C Company, 98th Chemical Mortar Battalion commenced a pre-attack bombardment of the trenches on Hill 355. At 0700 the infantry of the 2nd Battalion, 169th, advanced behind the tanks of the 716th. The tanks flushed out Japanese infantry from the trenches and cut through them with their mounted machineguns. The Japanese at one point attacked the tanks with bayonets. Still the Japanese held portions on the hill, while the Americans continued to attack day after day. After thirteen days of bombardment and assaults, 29 January, troops of the 43rd declared Hill 355 secure. Again, the objectives, the casualties, the Japanese resistance and the hills seemed to blind into an undiscernible mesh, remembered by the veterans of the 169th by the losses of friends and the ghastly sights, sounds and smells. The 43rd was relieved from the line on 17 February and became the 6th Army reserve. While it was not idle time, it was a chance for the men to sleep, maybe have a hot meal and refit for the next advance. The division was minus 215 officers and 3,805 enlisted. While in reserve, they would receive, eighty-four officers and 2,460 enlisted, including returning wounded and replacements. They were still severely short of personnel. There was one unit within the division that did not have the luxury of falling back and resting. The 169th, strengthened by support units and designated the 169th Regimental Combat Team (RCT), relieved worse battered units of the 40th Division and deployed to positions on the Central Plain, holding the western flank of that division’s line. They would not return to their parent unit until 1 March, and then go straight back into their own division’s front lines at Bamban. By 2 March the 169th was in the latest assault for the sheer rock faces and gorges that made up the mountain ranges northwest of Fort Stotsenberg. Fort Stotsenberg was a former cavalry post from the beginning of the century through the First World War. It became part of Clark Field and was captured in 1941 by the Japanese. Among the units captured there were artillery batteries operated by Filipino scouts and several American nurses. The 169th once again attempted frontal assaults on the hill complexes in the Scobia Ridge sector. The elements of the regiment were credited with the capture of Objective Hill and Twin Tip in that sector before attacking Mullen Ridge. It should be noted, Company I, 160th Infantry received a Distinguished Unit Citation for their success in taking and holding the peak of Objective Hill. The company was stranded under heavy fire for over thirty-six hours before reinforcements could scale the cliff-face. These actions took the 169th through 8 March. On 7 March Field Order 8 was issued to the 38th Infantry Division to act as the nucleus of 38th Division Advance – a task force which would include the 169th, again, designated as 169th RCT. The RCTs were formed for the purpose of a one-time, or limited, mission against strongholds or to make quick gains of objectives. The new objective(s) for Woods’ 2nd Battalion lay on the northern side of the Sacobia River and consisted of three hills running east-to-west. The ultimate goal of the task force was to take Mount Pinatubo just west of 169th’s last hill. This was the third phase of what was codenamed, M-7 Operation. The terrain in the area “was unlike any thus fought over,” wrote the author of Avengers of Bataan. The caves, fortified and armed by the Japanese were virtually impervious to concentrated mortar and artillery fire. On several occasions 75mm, artillery pieces were brought to the front and leveled on the caves. The artillerymen bore-sighted the barrels to fire directly into the mouth of the cave. When smaller pillboxes or tunnels were encountered, it was left to the infantryman to crawl or run as close to the opening as possible and toss a satchel charge inside. The last alternative was brutal extermination of the enemy with flamethrowers. During the fighting as part of the RCT, 10-15 March, Walter Woods remained fairly lucky until the 15th. On that date, according to the one surviving military document in his personal possession, he was wounded in battle. Although the form does not give the date or the degree of another bit of bad luck, he received a second Purple Heart for wounds incurred in action against an enemy force. To some extent he was wounded on the 15th but it is unknown if that took him off the line, or as would be the case so many times during his two perilous careers, he kept on moving and fighting. According to the document that Walter kept, he received two Purple Heart Medals for wounds attained in combat. Only the date, 15 March 1945 is reflected. It is possible that he was wounded twice on the same day or that the second wound was simply not recorded by a company clerk. His daughter recalled that he had what appeared to be a through-and-through wound on his lower hip. His friend, Ambrose Burns, also later recalled that Walter was shot through the sensitive, yet nonfatal, posterior. Both accounts corroborate one another. There is no doubt that Walter was in the thick of the unit’s fighting. While the Silver Star Medal index, the citation has yet to be located, indicates that he was serving with Headquarters Company (1st Battalion) at the time he earned the nation’s fourth highest medal for valor, most of his time was spent with Company E. His was only one of 739 Silver Stars awarded within the 43rd Division throughout the four years that unit spent in combat operations. Throughout most of April and the beginning of May, the 169th RCT was attached to the 112th Cavalry Regiment. The 169th fought in the ubiquitous open ground west of Bigti. The enemy artillery was so unremitting in that area that the slightest movements of the RCT or Cav. units brought a quick and deadly bombardment. The success of these advanced patrols into enemy territory by the RCT were essential. The depth and scope of the Japanese lines around Bigti had to be determined and that intelligence applied to the 6th Army’s plans to take their next major objective, the Ipo Dam. The bulk of fresh water supplied to Manila came from the dam via underground conduits. The Japanese, still controlling the dam, had closed the gates and cut the water to Manila. American forces not only had to take the dam, but do so with it intact. The Metropolitan Road, leading to the dam, was covered by well-dug-in Japanese forces in the steep hills overlooking the road. It was the RCT and 112th’s job to find out what would be the best approach to the dam and how difficult it would be to unhinge the defenders from their high ground. Even with the assistance of the 169th, efforts to gather the necessary intelligence by reconnaissance-in-force failed. The 112th was a green unit and basically not up to the mission. Their withdrawal turned into an embarrassment on their officers, who were sometimes sighted running from the fight and encouraging their men to keep up with their precipitous retreat. The more combat experienced 169th continued to operate in the mountains surrounding the Metropolitan Road as the other combat regiments of the 43rd made preparation to take the dam. On the 13th of May, the monsoon season began, opening with a downpour that closed the only road leading to the dam facilities. In spite of this, the 169th moved forward against the sheer cliffs and hills near Bigti. The division planners were counting on the attacks by the 169th to pull Japanese forces away from the dam and into the Bigti area. The gamble worked, but, of course, increased the resistance in front of the 169th. The 3rd Battalion, the spearhead, was forced to move at night against the defenses in Bigti. On 16-17 May, the Palisades, overlooking Bigti, were hammered with 50,700 gallons of napalm. Another 62,660 gallons were dropped on or near the Metropolitan Road. The 3rd then advanced on the Palisades, intending to scale them with bamboo ladders. Throughout the days and nights following the napalm drops, small groups of Japanese attacked alone the 43rd’s lines, in the now familiar banzai charge. Communication and resupply with their main command severed, the pockets of Japanese in the Bigti area committed to fighting to the last breathe. On the 18th, Woods’ 2nd Battalion relieved the 3rd on top of the Palisades. The Army Air Force plastered the road with another 68,000 gallons of napalm. With the assistance of Markings guerrillas, a two-prone attack was made against the dam. It was secured intact, as had been hoped. There was no rest for the highly successful 169th. They were once more formed into a RCT and sent to relief elements of the 38th Infantry 3-5 June. On 8 June, spearheaded by Woods’ Company E, the battalion took Mount Oro. The company followed closely an artillery barrage laid in front of their assault. They dispatched 131 defenders, still reeling from the concussion of 1000 rounds of shelling. The company suffered two of its own killed and another ten wounded. Thus marked what would be the last heavy action the regiment would see on Luzon. The 169th continued with mopping up diehards and putting out security patrols in the mountains surrounding Ipo Dam. On the 26th the division was moved to Camp LeCroix, a rest camp near Cabanatuan, site of one of the most successful POW rescues of WWII. Official orders were issued on the 1st of July releasing the 43rd Division from combat operations. Veterans of the 169th would remember Luzon as the battle for the next hill. With Japan’s capitulation, after the two atomic bombs were dropped in early August, the 43rd Division was loaded aboard transport ships as part of the occupation force. The division left Manila Bay on the 7th and arrived in Yokohama on 13 September. Led by PFC Fred Bonnell and General Joseph Cleland, the advanced party stepped off on Japanese soil. The men were moved to a semi-permanent base at Hara-Machida airfield, Atsugi, west of Yokohama and southeast of Tokyo. Some of the men with the most points began leaving Japan for home as early as 27 September. Walter’s ticket home was punched on 12 October and he arrived back in the States on 23 October, via a few stops so the transport could refit and refuel. While going through a steamer trunk with his daughter, a handful of keepsakes attributed to Walter’s time in service were discovered. 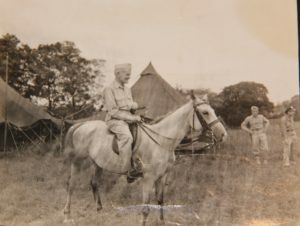 Among his pictures was one of General Walter Kruger on a rather dilapidated white horse, evidently on Luzon. The picture was easily recognizable as Kruger by the jotting chin and Roman nose. It may, however, be the only picture where General Kruger is flashing a full-blown smile. He was perpetually photographed with the stern tight-lipped killer look of a combat commander. What the commanding general of the entire 6th Army was doing in view of Walter’s camera and field camp will never be known. The general, being a San Antonio, Texas, cowboy, might explain how he procured a horse and got there – wherever there was on the map. 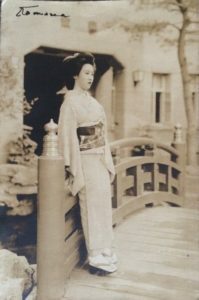 Another unique item was a postcard (pictures of the era were frequently printed on postcard stock) of a fully clad Japanese geisha. On the top is written in ink, “Komodo.” Kimono, of course, is a traditional woman’s garment. On the back of the picture is an inscription, apparently in Walters’s handwriting. It reads, “Given to me for present.” There is a date of 16 (17 was erased but still visible) September 1945, three days after the main body landed, and a location of Yokohama. The last clue to its origin is the name, what at first glance appears to be a large “N” and “Capt. 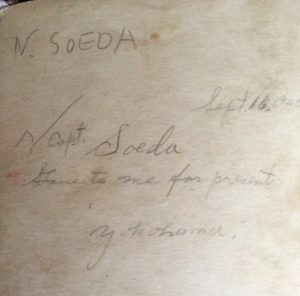 Soeda.” What appears to be another’s handwriting wrote in block letters on the left corner “N. Soeda.” After researching the, not exceedingly common surname, it appears that Captain “H” (not N) Soeda would have been Captain Hisayuki Soeda, Imperial Japanese Navy officer who surrendered Japanese forces on Nauru Island on 13 September 1945. If Soeda was flown immediately back to Japan, it is possible that Walter may have been in charge of a security detail for Soeda. It is unlikely at the time that Walter would have had any inkling the role Soeda was soon to play in several war crimes trials from early 1946 through late 1948. Soeda replaced Lieutenant Hiromi Nakayama on Nauru, after Nakayama came down with an illness. In a swift trial and hanging after the war, Nakayama was found guilty of executing five Australian POWs in 1943, thirty lepers and countless natives. His sentence was carried out on 10 August 1946. Soeda would again be called to give testimony in the war crimes trial of Vice Admiral Hara Chuichi in November of 1948. Chuichi was found guilty of “neglect of duty in connection with violations of the Laws of War committed by members of their command” as it related to protection of POWs under his care. He served a prison sentence of six years and was released in 1951. While the link between Walter and Soeda is possible, according to a statement made by Soeda during the trial in 1948, he, was a postwar POW on Bougainville. 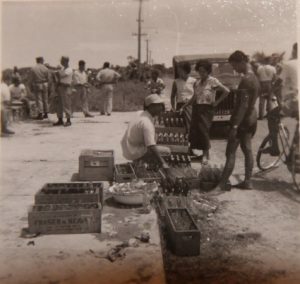 Records show that the officers and Nauru garrison, were taken aboard two Australian ships, the SS River Glenelg and SS River Burdekin, and transported as POWs to Torokina, Bougainville on 17 September, however, it does not necessarily mean that Soeda went via those ships directly to the prison. While it still seems evidence to the contrary, Soeda was living in Yokohama at the time of the trial. There was no other Captain Soeda listed in the Japanese forces at the time. 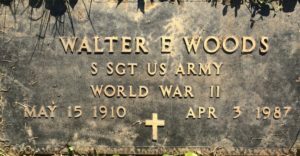 Like all combat veterans, especially of WWII, Walter Woods carried the scars of that conflict for the rest of his life – both outwardly and inside. His daughter stated that on rare occasion he made brief and guarded comments about the war, it was evident that he suffered from the trauma of combat. He spoke of losing his friends and the horrific nature of their mangled bodies. The sight of his buddy’s guts blown from his body haunted Walter. Combat is a hell that cannot be described to those who have never experienced it, and a memory branded too vividly in the minds of those who have. The sights, sounds and smells of the battlefield seem to wait just below the surface of the conscious mind and return to torment the veteran at any moment of the day or night. Walter recalled the fear that overcame replacements and veterans alike, a fear that made them sometimes freeze and become catatonic until the enemy mowed them down like so much cannon fodder. Ambrose Burns shared the same way replacements were killed on Okinawa. Walter returned home and went back to work with the newly formed State Police. In the coming years he buried the reminders of the war-years from the sight of daily life. He made a career in law enforcement and no doubt used some of the lessons learned on the battlefield. Throughout the years leading to his death, Walter received letters from men he had led through the horrors of combat. They wrote to him to express their thanks for the life they attributed to his guidance and actions. Superhuman efforts, by him gave them a chance to work, play, have a family and grow old; a life that had no guarantee in the more than ten months he brought them through hell and then home. Walter was a renowned and successful detective for the Kentucky State Police after the war. He fought as hard at times, to protect the streets of Kentucky as he had to salvage the lives of his soldiers; but that is a different story. Walter E. Woods passed away on 3 April 1987. He is buried at the Woods Cemetery at Goose Rock, Kentucky. Never forget their sacrifice. Col. John J. Higgins, A History of the First Connecticut Regiment: First Battle Group 169th Infantry, Connecticut Army National Guard 1672-1963 (Hartford, CT: unpublished), http://web.ccsu.edu/vhp/Higgins_John/History_of_first_CT_regiment.pdf. Robert Ross Smith, The War in the Pacific: Triumph in the Philippines (Washington, D.C: Government Printing Office, 1993), 80. “G.I.s Fight Four Days For Luzon Fortified Hill,” Chicago Tribune, 15 January 1945, 2. Joseph Steinbacher journal, Veterans History Project, American Folklife Center, Library of Congress, 44. “Harry F. Sellers 1935,” http://apps.westpointaog.org/Memorials/Article/10449. Accessed 5 March 2016. Joseph E. Zimmer, The History of the 43rd Infantry Division 1941-1945 (Bennington, VT: Merriam Press, 2012), 88. After Action Report 716th Tank Battalion 9 January 45 – 8 February 45. General Order 68, War Department, 14 August 1945. RCTs were used frequently by the U.S. Army in all theaters of WWII. After the war, the Army ceased to organize RCTs in following conflicts but the U.S. Marine Corps picked up the idea and continues to use RCTs today. Report on the M-7 Operation: 38th Infantry Division “Avengers of Bataan” 19 January 1945 to 30 June 1945, 67. Major James S. Powell, Learning Under Fire: Military Units in the Crucible of Combat (Unpublished monograph, 2006), 54. Roger J. Spiller editor, Combined Arms in Battle Since 1939 (Fort Leavenworth, KS: Army Staff College Press, 1992), 254. Augustin V. Marking the nom de guerre for Marcos Agustin, a former boxer and Manila cabby, formed the guerrilla regiment after the occupation by Japan. He based his command primarily out of the mountains of Sierra Madre, where the 169th was fighting in 1945. The U.S. Navy maintains a Naval Air Station at Atsugi. Navy JAG Case Files of Pacific Area War Crimes Trials, 1944-1949, National Archives Catalog ID: 1661897, Pub. 72. Case File Number: 167174, NARA, Washington, D.C. Very interesting indeed. You might be interested to know about the project underway to travel to Nauru with a small team of professional archaeologists etc to locate the remains of the 5 Australians who were executed there in March 1943. Soeda is a name I’m very familiar with. Nauru Missing 5 Project – Historian. Thank you for publishing this. My father was a S Sgt Co E, 169th Infantry in WWII and I was wondering if you had any other information regarding any of the other men that served with your Dad? My father passed away when I was very young so I didn’t get to talk with him about it. Also, he didn’t really like to talk about it. I do know that he fought in the South Pacific but not much more than that. Do you mind sharing any information or resources you might have?